I’m pretty sure that packing a first aid kit is not one of the first things that come to mind when getting ready for an upcoming trip, especially if you want your backpack to be the smallest and lightest possible. Packing light is one of the things every backpacker looks for, but being safe and cautious should also be high on the list of priorities. 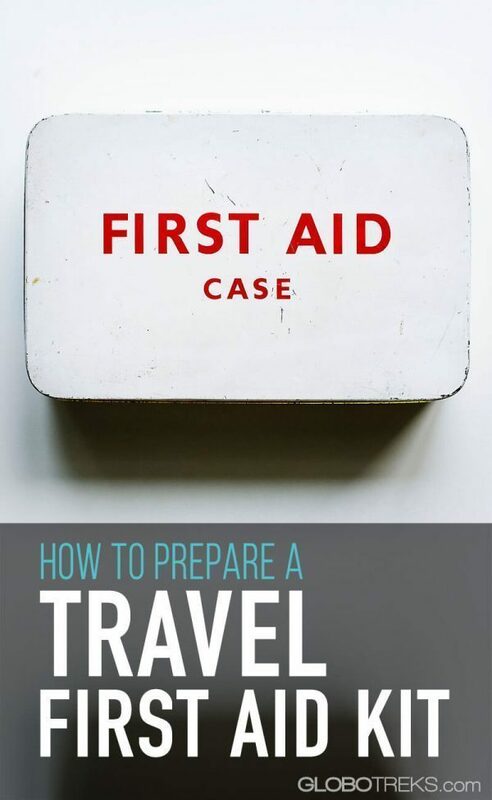 The answer to what should be included in a first aid kit is not an absolute one; it depends on the health needs of the person who will be using it, the destinations to be visited, and the length of travel. But in general, these are the most important things that should be included in order to take proper care of minor wounds and health emergencies. Personal/prescribed medications – Carry more than the amount needed for the duration of your trip to account for possible delays due to weather, cancellations, unexpected layovers, or simply just wanting to stay extra time at your destination. Tylenol/Paracetamol – pain and fever reduction. Ibuprofen – stronger pain and fever reducer, anti-inflammatory. Antihistamine/Benadryl – allergies, sleep aid. Pseudoephedrine – nasal decongestant, helps with “ear pop” from planes. Cold & Flu Tablets – to treat cold & flu symptoms. Motion Sickness Medication – in case those long bus rides or boat trips have an effect on you. Rehydration tablets/Electrolyte packets – for replacing loss due to vomiting or diarrhea. Antiseptic towelettes – cleaning hands and wounds. Iodine Pads – used to kill sensitive bacteria in minor wounds. Antibiotic ointment – to prevent infection in minor cuts and scrapes. Q-Tips and Cotton Balls – help clean and apply topical medication to wounds. Tweezers – to remove ticks, thorns, cactus, sea urchins, etc. Moleskin/2nd Skin – to protect blisters on feet and hands. Band-aids – different sizes and shapes for minor cuts and scrapes. Butterfly Band-aids or Wound Closing Strips – help close open wounds when a visit to a doctor or stitches are not immediately available. Micropore/Medical Tape – to keep gauze pads in place and it serves as an alternative to butterfly band-aids when cut in the proper shape. Small Scissors – to cut gauze pads and medical tape to desired size and shape. Thermometer – to check how serious is your fever. Gloves – to be hygienic and to protect yourself in case you’re helping someone else. Preferably latex free. 4 x 4 gauze pads – for minor cuts and scrapes. Hand sanitizer – good to keep hands clean and sanitary, dirty hands can infect cuts. Safety pins – quick fix for clothing, making an arm sling, emergency cloth. Insect Repellent – to reduce the chances of mosquito bites that could transmit diseases. Sunscreen – SPF 15 minimum. Eyewash – a good solution to clean eyes when fresh water is not available. Multi-vitamins – to keep a healthy level of vitamins in your body. Hot/Cold Pack – to treat inflammation topically. Matches – light source, fires. Portable flashlight – looking into mouths, dark rooms. Swiss Army Knife – good multi-purpose tool. Flashcard with Emergency Contacts – get important local phone numbers from Police, emergency contacts, hospital, etc. This kit should be packed in a small case, preferably plastic and waterproof. Medications can be stored in small re-sealable plastic bags (properly marked) to avoid carrying a whole bottle when it is not needed (ie. short trips). The point is only to deal with minor emergencies, not manage on our own problems that may require medical assistance. Although it looks like you’re carrying a huge amount of medical stuff, what’s mentioned above only composes a “Basic Travel Kit” and it doesn’t take much space if properly organized. This kit is ideal for a trip through developed cities where advanced medical care is easily found and where re-supply is possible. The items and amounts are highly customizable to your personal needs and destination. If you don’t feel comfortable preparing a travel first aid kit on your own, you can buy one from many pharmacies and retailers. Adventure Medical Kits is a well-respected brand that sells first aid kits specially designed for different travel styles that go from the basics to the extreme expeditions. Or, you can go with cheaper options easily found on Amazon. 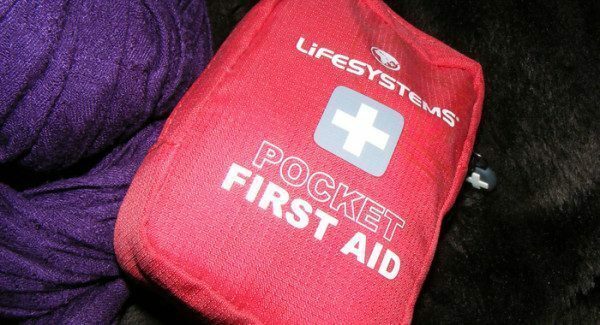 Having a proper first aid kit is one of the things that are best to learn beforehand rather than the hard way. I always carry a first aid kit, but after a recent accident, I discovered the importance of carrying a good first aid kit all the time. You should always have your first aid kit easily accessible in your backpack, but if you always carry a daypack, you should have a smaller version of your main first aid kit with you so you have the most important items while sightseeing or roaming around during the day. Accidents can occur at any time, any place, and you can’t use your first aid kit if it is not with you. It is like the travel insurance you hope you never have to use, but that you should always carry. Images by el_staplador and Robert Thomson respectively from Flickr’s Creative Commons. Excellent tips, Norbert! Never thought about safety pins, but good idea. One of my favorite travel first aid products is Band-aid Friction Block Stick — prevents and heals blisters. Oh yes, Blister band-aids are a must for travelers that walk a lot or are susceptible to getting them. These are very good tips! I am not very good about being prepared for illness etc when traveling but this may be because I haven’t really traveled in an area I couldn’t purchase the necessary supplies. That said I am the proud owner of a digital themometer that is in Celsius! Maybe better preparation would have saved me a little bit. You might be surprised how certain items that seem so common to us are hard to find at certain countries. i experienced this when I needed butterfly bandaids and there was not a single pharmacy that sold them either in Copan, Honduras or Antigua, Guatemala. From this now I’ve learned to always carry the things of first need. I never would have thought about packing a first aid kit, but after your experience, I can see why it could be important. I would also act duct tape. It works great on blisters and for a variety of other things as well. Yes, duct tape is a useful tool for many things and quick fix ups. Good tips here Norbert. But highlight in big lettering NOT to carry scissors, pocket knife with the first aid kit in your carry on or daypack when travelling on planes. I had a perfectly good Leatherman multi tool confiscated because I had forgotten all about it in my daypack when flying back home! Great advice. I usually sacrifice this kit to make way for space in my bag – probably not a good idea. Sometimes I tell myself “why the hell are you carrying this, take it out and save some space”… I’m glad I always left it in, especially during this last trip. You never know when it’s needed. I could really use this Norbert as I am a big time klutz! I can’t believe this can all fit in a small case. Yes, the list looks long, but the items are mostly small or flat, so fi packed properly it might take no space in your backpack. Thanks Mike! Great to see you around. 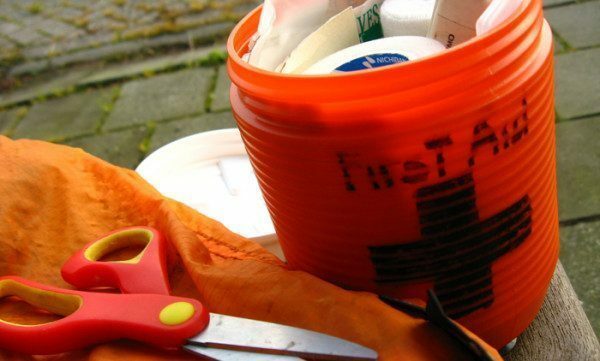 Yeah, make a DIY first aid kit with your Gatorade can, it might fit everything you need to take care of the basics. That’s a very Boy Scout way to do it. I should do that cuz I love scaling up ancient stone temples. This is a fantastic list, Norbert! I don’t bother with insect repellent anymore, I ask locals upon arrival on what works best for them and that has so far proven a good strategy. Had many disappointing DET moments. That’s a good strategy for insect repellent, and it can even work for a few more things. Great tips and very helpful! I always carry a first aid kit with me when I travel and with some powerful antibiotics. My doctor helped me to prepare a kit when I trekked through the jungle in Thailand. Since then I always keep it up to date and ready to go! I kind of learned the importance of having a good first aid kit when I was a Boy Scout, but I reaffirmed it a few weeks ago with my accident. I learned to always travel with a first aid kit. Great list! Comprehensive but also very compact! I think this is something we can get knocked off our to do list this weekend now! Thank you for sharing the useful health related advice for travellers. Thanks. I hope to hear your opinion. Thank you so much! At the moment I’m 31, though I quit my job when I was 28. Hmm, to be honest, I haven’t met that many black backpackers. I have come across a few of them, of course, but when you compare with the number of backpackers from other races, I admit that they are the least I’ve noticed. Good post Norbert, I always carry it & often check for items which is expired. I do usually carry a first aid kit whenever I travel with my family, but I have to admit it is not as comprehensive and compact compared to the one you have delivered in this article. Great work Norbert! I had never thought about including safety pins in my first aid kit. I can see why this would be really useful to have, especially when you have to use it as a sling or cast. I’ll have to go out and buy some to add to my kit. Thanks!